Good afternoon, dear readers! Has you favorite indie polish brands contributed to collaborative subscription boxes and you had to miss out on it? Perhaps you only wanted a single polish from the box offerings, or maybe the box was just too expensive for your budget? Maybe it's a little bit of both? Trust me, dear readers, I have been there many times, and I know just how frustrating it is to try and determine whether or not your desired nail polishes are worth the extra cost. It's not always easy to find others to split the subscription boxes with you, and I have been burned a few times when it comes to people backing out after I've already paid the initial costs. It is not a fun situation to be in AND NOW YOU DON'T HAVE TO WORRY ABOUT ANY OF THOSE THINGS!! Thanks to Polish Pickup, you can now purchase only the indie polishes you want! Adrienne and Sarah of Fair Maiden Polish recognized the dilemma faced by many lacqueraholics, and the result is the Polish Pickup. A theme suggestion document is put on the website each month, and individuals can submit up to three suggestions for consideration. Once the time frame for submissions ends, the top 10 suggests can then be voted on to determine the next upcoming theme. Indie makers then take the selected theme and create a polish. There is no set list of indie makers that participate every month so if your favorite indie brand isn't participating this month, you may see them in the future! The May theme for Polish Pickup is "Science", and as a scientist by trade, or at least before I hung up that hat for my blog, I approve of the choice! Today's blog post features a beauty inspired by the building block of life, DNA. 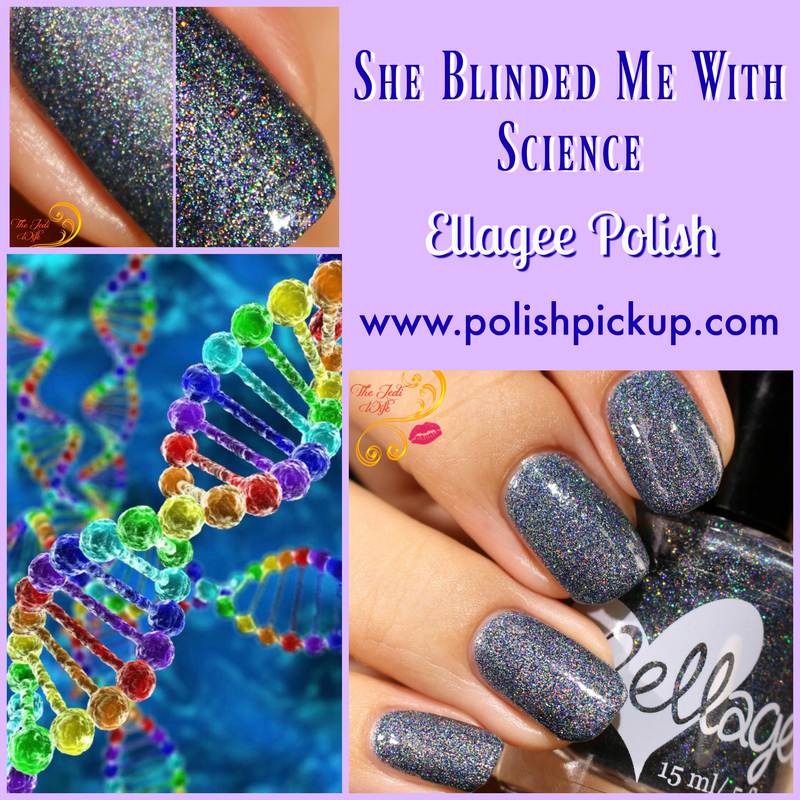 Introducing the beautiful She Blinded Me With Science by Ellagee Polish! 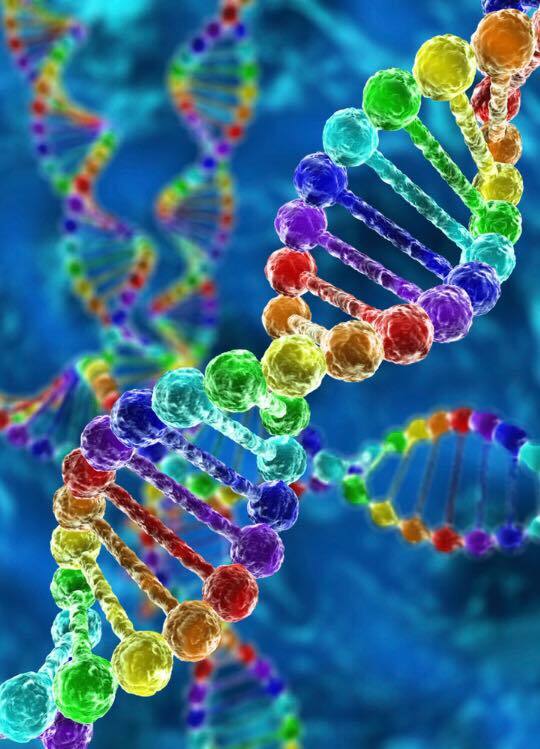 She Blinded Me With Science was inspired by this art of the DNA molecule and named for Rosalind franklin, the first person to photograph DNA. Her credit was stolen by male scientists who used her work to determine the structure of DNA and later won the Nobel Prize. She Blinded Me With Science is a smokey blue jelly polish loaded with microglitters in a rainbow of colours. Shown with three coats plus top coat, this polish is all about the sparkle! Even with all the glitters, this applied like a dream come true, and I have no issues to report. Unsurprisingly, it does dry to a slightly textured finish, but it smooths out easily with top coat. I used two coats of HK Girl top coat for an even finish on my nails. With all the microglitters in this beauty, I naturally needed to add matte top coat to tone down the shine but make the colours POP! Check it out! While I am the first to admit the matte look isn't exactly my favorite with this polish, I do love that you can easily make out what all is going on with this finish! She Blinded Me With Science and other polishes created for May's Science-themed Polish Pickup can be purchased from the Polish Pickup website located here. The shop will be live from Friday, May 5th at 11am EST until May 8th midnight EST. Please note that the shop will ONLY be open during this time, so if you want any of the polishes from the May Polish Pickup, please mark the dates on a calendar so you can get those orders in! Also to note, all purchases are made as a pre-order. Please allow two to three weeks after the preorder has closed for polishes to be shipped to you. Choose as many or as few shades as you want! Are you excited about the May Polish Pickup? Have you seen other offerings for May that you need? Do you prefer She Blinded Me With Science shiny or matte? I'd love to hear from you! Holy batman that sparkle! Now I'm over here singing. I entirely blame you for that. I love that she used this name! All that glitter - they look so pretty together! Yeah, I think this is going on my need list! oh how interesting!!! I always have half a fomo each time any kind of box is listed. there's almost always 1, 2, or 4 that I want, but not all. sigh. i'm joining the fb group and see if I can snag some of my wanted pretties. Stunning swatch and polish. I how freaking cool that you're a fellow scientist! I'm no longer on the bench, but once a scientist, always a scientist! I love how the polish looks shiny but it's definitely gorgeous matte as well. Pretty! I like that you showed it with matte topcoat! Oh em geee I love this matte!! OMGGG this is so incredible!! I think I prefer it shiny!